PDF to Word Converter is an easy-to-use application, which is specially designed for converting PDF to word 2007 (.docx) and 2003(.doc). Compared with PDF to Word 1.0, PDF to Word 2.0 is improved greatly in functionality, stability and speed. Just with one click, you can convert your read-only PDF files into fully formatted editable Word documents at a high speed. Shortcut conversion—Right-click on a PDF file and convert it into a Word document without launching the program. 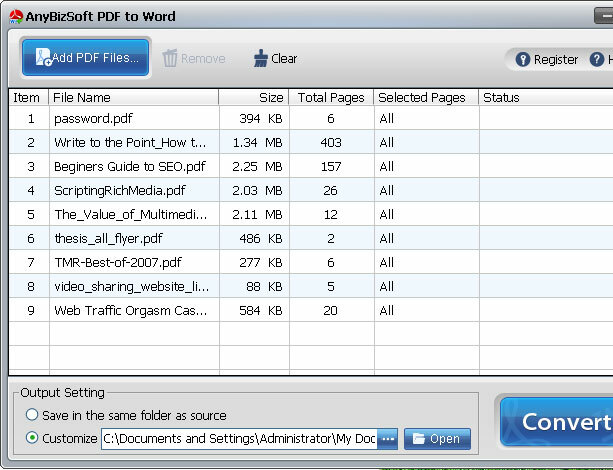 Optimize for dual-core and multi-core processor, 300% faster than other PDF to Word Converter. Free e-mail technical support, provide the best service for you. Step 1. Download and install PDF to Word Converter, and then run it. Step 2. Importing PDF files. Click Add and browse your computer files to locate the PDF files to be converted. You can import as many as ten files in this program. After the files are imported, the file information will be shown in the panel. Step 3. Converting PDF files. Just click the Convert button, and wait for a little while, you will get the Word files as you want. During the conversion, you can terminate converting the files by clicking the Cancel button where the Convert button is. After the conversion is completed, a dialogue box will pop up, informing you the conversion is finished. You could click Open to go to the destination folder.